For the first time since 1971, no one is elected by the BBWAA to enter the Hall of Fame on January 8, 1996. Phil Niekro, a knuckleballer who spent most of his career with the Braves, comes the closest with 68 percent of the writers’ votes but falls short of the 75 percent needed to be selected. Next year would be different! 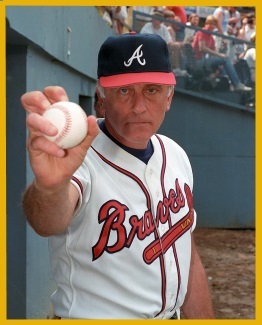 Knuckleballer Phil Niekro, who compiled a 318-274 record during his 24 major league career, becomes 227th player elected to the Hall of Fame on January 6, 1997. ‘Knucksie’, who spent two-plus decades with the Braves, also had short stints with the Indians, Yankees, and Blue Jays. Phil and his brother Joe Niekro amassed 539 wins between them, the most combined wins by brothers in baseball history, and Phil’s 121 career victories after the age of 40 is a major league record. His longevity is attributed to the knuckleball, which is a difficult pitch to master but is easy on the arm and often baffles hitters due to its unpredictable trajectory. At the age of 48, Niekro was the oldest player in major league history to play regularly until Julio Franco played at age 49 in 2007. He set a major league record by playing 24 seasons in the major leagues without a World Series appearance. His total of 5,404⅓ innings pitched is the most by any pitcher in the post-1920 live-ball era. He only appeared in the postseason twice, making a playoff start in 1969 and again in 1982, both for Braves teams that lost the series.